The Wasps Worksheet – Download free science worksheet printables for Second Grade Kids. Our fun facts about wasps worksheet is ideal for First Grade to Fifth Grade kids, as well as Preschoolers and Kindergarten kids. Kids from Pre-K to 5th Grade can enjoy learning fun facts about wasps through this worksheet. The free wasp facts science worksheet is both downloadable and printable. The Wasps worksheet contains a printable hidden word seek puzzle along with a find-the-missing-words search game. If your kids are being home-schooled you can use this free science worksheet printable to educate your kids about wasps and gain their interest in science. Your children will learn well, since they’ll need to read and re-read the facts about wasps page to find the missing words. Our free printable science worksheets are a fun approach to making learning science interesting for kids. Teachers can use our free Wasp fun facts printable science worksheet to make science classes more interesting for kids. Educators and private tutors can utilize our printable science worksheets to supplement after school activities and special education programs for kids. 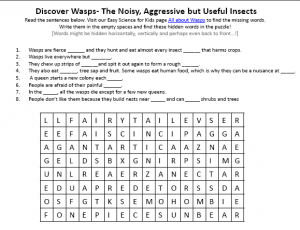 Primary school kids from Grade 1 to Grade 5 can enjoy the word search game and use this facts about wasps worksheet as a science reading comprehension worksheet. Younger kids in Pre-K and Kindergarten can enjoy this free printable science worksheet as a listening comprehension exercise. Our fun science facts for kids website offers many more free to download science worksheet printables for Pre-K up to Grade 5 kids. Download our free hidden words puzzles and easy science worksheets and make learning science fun for kids! Wasps can be nuisance to some people because they like to come to eat human food. Especially sweets and honey sandwiches. However, they are very useful, as they act as pest controls by eating insects that harm crops! Learn fun facts all about wasps by downloading this free science worksheet printable! [sociallocker]Get the fun facts about Wasps free science worksheet for kids. Download FREE Wasps Worksheet for Kids! Did you enjoy the FREE Wasps Worksheet for Kids? Read lengthy information about Wasps here. Declan, Tobin. " Wasps Worksheet - Download Free Science Worksheet Printables for Second Grade Kids - ." Easy Science for Kids, Apr 2019. Web. 23 Apr 2019. < https://easyscienceforkids.com/wasps-worksheet-download-free-science-worksheet-printables-for-second-grade-kids/ >.